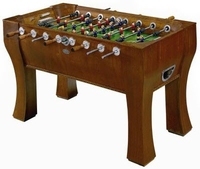 The Aurora foosball table has a futuristic looking design that features robot designed players instead of the traditional man. 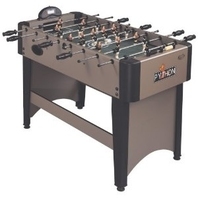 The Aurora is a fairly solid table in terms of leg design for this price range of a table. 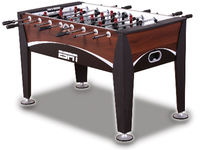 However it falls short of many of the foosball table features and qualities we look for when analyzing a table for performance. 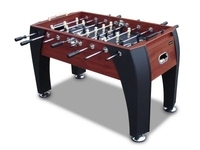 The lack of adjustable legs, wooden handles, side ball returns, ridged foosball man foot design, and other overall lack of quality make this table not one of our top recommended. 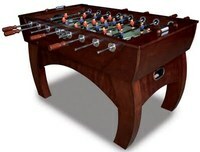 The Aurora table doesn't allow for some of the more complex shots like the snake shot due to the thicker and more rounded toe design like the Tornado or Dynamo brand tables have. 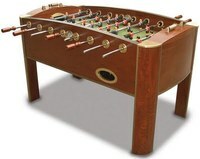 This foosball table is priced at around $290 US.